I managed to finish this off tonight, and I really like how it turned out. Wow, great cardigan. Love the stuff you make! Hi! I saw your sweater on Crochetville and love it! I checked out your blog and really enjoyed your work! 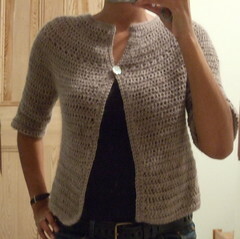 I also went to Ravelry and joined the Seamless Crochet group. Anyway, just wanted to say Hi and introduce myself! Faboo! The cardigan looks lovely! Did you invent this pattern? I have been reading your previous posts since seeing this on craftster and your work is lovely! You make me feel so ambitious with my crochet! I would love to know if you sell your patterns? Or write down note with hopes of selling, etc. If you ever need a tester I’d be willing to do it! Your work is so simillar to my tastes! If you don’t have a shop to sell your patterns through then I”d love the url. Thanks for the compliments. I don’t write up my patterns as such. I come up with an outline, but usually change things as I go along. I might actually write this one up though, and will post on my blog if and when I do so. It’s very “simple” (not sophiticated) but its makes your cardigan even more interesting and nice. It suits you very good with the button at the right place!